Nestled in the heart of the DFW metroplex, the Northshore trail winds along the northeastern side of Grapevine Lake through the towns of Flowermound and Grapevine. With easy access to two main trailheads, this has become one of the most visited mountain bike trails in DFW and is said to average roughly 800 visitors per week. Not to worry though – with over 22 miles of tree covered trails, turnoffs, and picnic areas it’ll hardly feel crowded. From the Madd shelter trailhead inside Murrell Park there are two major loops to choose from. The West Loop takes you through dense brush and forest and is meant for more advanced mountain bikers. With major rock gardens and steep pitches along the way it can be a challenge to pass through for even the best riders. The East Loop is the easier of the two, but is no easy ride itself. Long sandy stretches, root steps and rock ledges, along with clearings and meadows make up the majority of this section of trail. The Northshore trail is by far the largest mountain bike trail in the metroplex. Because it’s situated in the middle of the two big cities of Dallas and Fort Worth, it’s easy for visitors from the suburbs to get there and long enough to merit a good day trip. In the hot Texas climate, lakes reign supreme for recreation and entertainment. Fortunately for visitors to the Northshore Trail, it follows the winding lake shore and allows for much needed breaks near the water. If you are experienced enough to dare the West Loop, you will find yourself in a place that seems far off from the two nearby cities. Once you leave the Madd Shelter where the loop originates you’ll be immersed in North Texas forest. Smooth dirt and sand trails wind through the back woods and are interrupted quite frequently with challenges of rock outcrops, roots, and hairpin turns. 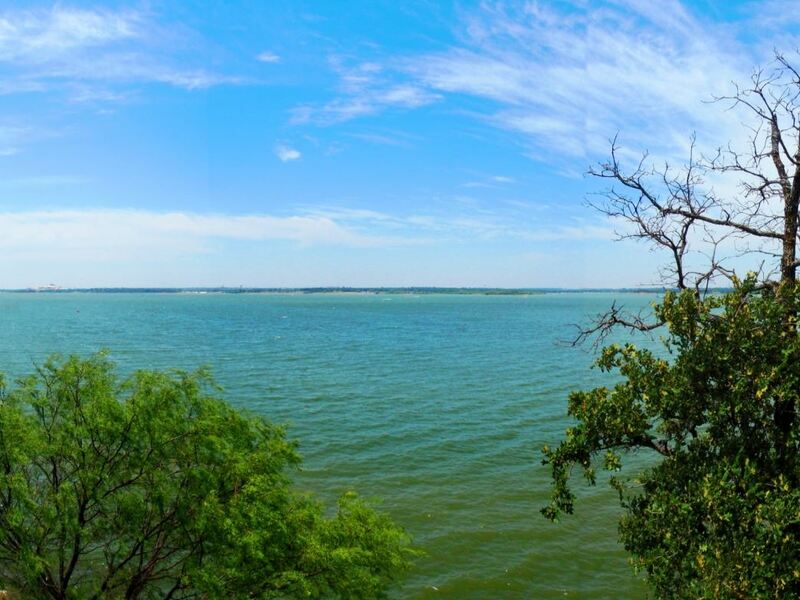 The halfway point of this trail will take you to one of the Twin Coves area where some secluded views of Lake Grapevine can enjoyed. The East Loop as a whole is much easier. The trail starts out as a flat sandy single track with a slight slope down towards the lake. Darting in and out of the trees you will pick up speed until you hit a meadow by the water. There you will find small jumps and moguls before you are thrust back into the forest. Dry creek beds, stumps, and switchbacks are all part of the rest of the ride – with plenty of challenging spots for the intermediate rider. While there are some difficult spots to navigate through, there are typically detours to avoid the obstacles. Novice riders will feel comfortable testing their medal on this loop without the fear of getting lost or stranded. There is enough traffic on the trail so a friendly hand will be there in the event of a problem, but not too much to feel over crowded. With turnarounds every few miles, it’s possible to customize your trip to the length you want it to be. That makes it easy to spend an entire day out riding, or just a few hours on the trail if that’s all you have. Although trail runners, hikers, and families will all enjoy the serenity of the wooded trails, this is really a DFW mountain biker’s sanctuary. With miles and miles of varied skill level single track, riders from all walks of life can enjoy themselves for hours. To reach the MADD Shelter Trailhead, enter through the Murrell Park entrance and pass through the ranger station. Taking your first right at the stop sign, keep right until you reach the sign marking the trailhead and park there. If you’re just looking to enjoy the East Loop and avoid the drive through miles of neighborhood streets, there is a trailhead and parking lot at Rockledge Park. The fee to enter is $5.00 per vehicle. Make sure to bring lots of water, and always wear your helmet!